Be the first to share your favorite memory, photo or story of Monta. This memorial page is dedicated for family, friends and future generations to celebrate the life of their loved one. Monta Rae Gilkerson Glaser, age 55, of Mt. Vernon, Missouri, was hit by a car and passed away on Friday, February 1, 2019. Her tragic and sudden death leaves a gaping hole in the lives of those who knew her. Monta Rae was a ray of sunshine and she brought joy and love to everyone. Her infectious laugh and fun-loving personality lit up every room. Her soul is now celebrating in heaven. Monta Rae was born May 24, 1963, in Falls City, Nebraska the daughter of Bill and Kay (Little) Gilkerson. 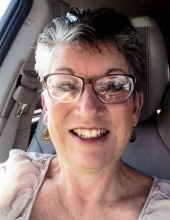 Monta Rae was a 1981 graduate of Cassville High School in Cassville, Missouri and graduated from St. John’s School of Nursing in 1983 with her nursing degree. Monta Rae was a registered nurse. She worked as a flight nurse for many years at Hammon’s Life Line with St. John’s Health System. She also worked in the emergency department at Cox and St. John’s/Mercy. Monta Rae was an educator at heart. She spent many, many years teaching nurses, EMTs and paramedics how to give good emergency and trauma care. She was also a teacher of life. On May 29, 1982 she married the love of her life, Bruce Glaser in Monett, Missouri. Monta Rae and Bruce’s loyalty and love for each other served as an example for many couples. They opened their home to friends and family and those who know them well surely attended a swim party or a game night at their house. Monta Rae is survived by her husband, of 37 years, Bruce; one son, Levi Glaser; two daughters, Misty Glaser and Lizabeth Shively, and her husband, Jesse and a seven-month old granddaughter, Rilan JoAnn Shively. Monta Rae is also survived by her parents, Bill and Kay Gilkerson; one sister, Jodi Stone; her best friend, Pam Holt and a host of other family and friends. Monta Rae was preceded in death by her maternal grandparents, LeRoy and Helen Little, paternal grandparents, Paul and Mary (King) Gilkerson, father and mother-in-law, L.H. and Lizzie (Mayfield) Glaser, three brothers-in-law, Carl, Lyndal and Larry Glaser, sister-in-law, Charleen Glaser, aunt, Carolyn Meinzer and best friend and sister-in-law, Marla (Glaser) Ingle. As selfless as Monta Rae was in life, she was in death. She donated her body to the United Tissue Network so others could continue to learn. A celebration of Monta Rae’s life will be held at 2:00 p.m. on Saturday, February 9, 2019, at the Church in Action in Mt. Vernon, under the direction of the Fossett-Mosher Funeral Home in Mt. Vernon. A reception and greeting of guest will follow. In lieu of flowers, the family request donations be made to the Rilan JoAnn Shively Fund in care of the funeral home. To plant a tree in memory of Monta Rae Glaser, please visit our Tribute Store. Church in Action, 12928 Lawrence 1147, Mt. Vernon, MO. Memorial donations may be made payable to the Rilan JoAnn Shively Fund, in care of the funeral home. "Email Address" would like to share the life celebration of Monta Rae Glaser. Click on the "link" to go to share a favorite memory or leave a condolence message for the family.